Why are my prints too dark? Often this comes with a query as to whether it’s worth getting print profiling equipment such as the ColorMunki or SpyderPrint. ‘Your monitor is probably too bright’ is our most common answer. Keith looks briefly at the issues and suggests some differing approaches to dealing with the problem. April 2018: This is one of our older articles – some links to products and resources have been updated since writing. You’ve spent a lot of time getting an image to look just right on your screen, you select your paper, you hit the ‘Print’ button, out comes the print. Something doesn’t look right. You take the finished print out of the printer and it’s just too dark. That shadow detail you’d worked on in Photoshop – all gone. I’m going to try and avoid a lot of the more technical answers here – the simple answer is likely to be ‘turn down your monitor brightness’ – if you were just after a quick fix, then try it (of course I’m going to suggest coming back to the article later and finding out why it helped, and how to do it more accurately). Many people decide to do something about their print problem and after reading up on the web, possibly including some of my colour management equipment reviews, they decide that they need to profile their printer. It’s at this point I often get asked as to what equipment is best value/quality. First there are a whole load of other things you need to consider. Think of it as a chain running from taking the picture, through to holding the final print in your hands – lots of potential weak links. For the purposes of this article, it doesn’t matter if you capture your pictures in JPEG or RAW format. I’m assuming that your pictures have the right white balance and are correctly exposed. I choose to always shoot in RAW format, but that’s for a whole lot of reasons. Not too much to worry about here, but you do need to be consistent. Although there is some debate whether, for example, you work in Adobe98 or sRGB, the key thing is to be consistent. For many real world prints, your choice makes little difference. I’ve an article covering this in more detail – Choosing a working colour space. Use colour managed editing software, such as Aperture, Photoshop, Lightroom or the much cheaper (but still very good) Photoshop Elements. If you can’t find anything about colour management settings in your photo editor, then there is a serious possibility it doesn’t manage colour correctly – this is not a good thing. I’ll come back to this one, but suffice to say, you need to calibrate your monitor to some known consistent setting. The picture shows a typical monitor calibrator, the Spyder3 Elite. We’ve detailed reviews of most models and makes available on this site. 2018: See the i1Display Pro and Spyder 5 for newer examples. Your room lighting level for working at a screen makes a difference as to how you perceive brightness and contrast levels. It affects colour a bit too, but that’s a bit beyond what we’re looking at here. Ideally your monitor at it’s brightest (white), should be the brightest white you can see when looking towards the screen. i.e. no bright desk lamp next to the screen where you can see the bulb. A while ago I wrote an article specifically dealing with room lighting and related issues, this includes some suggestions as to appropriate monitor calibration settings. The print looks too dark? How do you know? 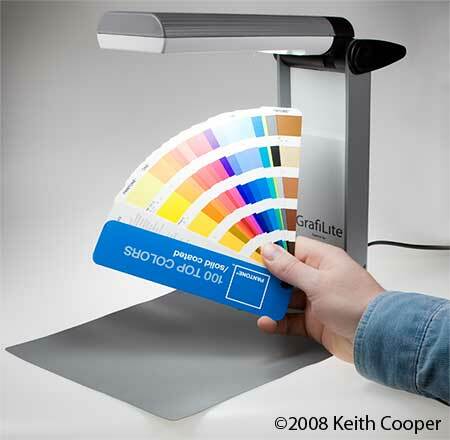 The best lighting conditions for print evaluation depend on what you’re evaluating it for. For an exhibition print, then similar lighting levels and lighting type to where it will be displayed are important for those final checks. For looking at detail for imperfections, such as a misfiring nozzle on an inkjet printer, you need a bright light. For soft proofing and editing, the print should be viewed in a light that is bright enough to make the whitest part of your screen match the brightness of the brightest white in your print (usually the paper itself). I often get asked for suggestions about learning more about the nuts and bolts of Colour Management. My usual suggestion is Bruce Fraser's Real World Colour Management. My own copy is well thumbed. It's my first port of call if I'm asked a question and I feel I don't quite understand an issue well enough to be absolutely sure of an answer. I’m lucky enough to have an adjustable print viewing cabinet that I use, but once again the key factor is that I’m adopting a consistent approach. There are quite a lot more details about viewing, lighting and proofing in the viewing cabinet review. Whatever approach you take to viewing your prints, try and make it a consistent one. In producing my own prints, I try and make the whole process as consistent as possible. Then when I see something not looking quite right, I can pin down where the problem is likely to be. First of all …you do have your monitor calibrated? This has to be the first variable you tackle. There are a number of monitor calibration solutions on the market – we’ve reviews of most, so I’ll not go into details of functionality, but they’re all pretty easy to use. The key to the dark print problem is usually that people have their monitors set too bright. When the monitor is bright, the dark areas are brighter too, this gives the subjective effect of ‘opening up the shadows’. As with most things connected with vision, it’s not quite as simple as this, but it’ll do for the moment. The usual approach is to recommend a particular value for the brightness (or luminance) of your monitor. This is even more important with modern LCD screens, since they are inherently much brighter than our old CRT monitors. Some more basic calibrators don’t have a setting for screen brightness adjustment. For an initial guess, I’d try setting screen brightness to around 60% of maximum before calibration (or 40% for iMacs and other ‘bright’ displays). Whatever you set it to, just reduce it from the settings that are giving the dark prints. The luminance value depends on your ambient light levels to some extent, and some profiling solutions will suggest monitor settings for a screen brightness based on these ambient light levels. Do note that this ambient measurement is -not- the same as the dynamic adjustment you can get with the huey calibrator – a feature I always tell anyone with a huey, to leave firmly turned off. 2018 – The huey is long gone – don’t be tempted if you see one going cheap! How dark should your room be? If you are producing good quality prints, but are having difficulty with them looking a bit too light or too dark, it’s quite possible to use a print to get a better idea of the monitor luminance you should try. If you just print your own work, then matching your screen brightness to a known good print of a test image when viewed under your normal print evaluation lighting will usually suffice. We have a range of free test images available for colour and black and white – just don’t use one of your own photos as a test print. I often use the Datacolor one, for which we’ve a full description of what each part of the image is there to test. Once you’ve got the monitor and viewing levels set, it’s much easier to evaluate overall print quality by comparison, and then edit your images to get better prints. The photo above, shows the difference you get when looking at images with different white points (colour temperatures). The light from the viewing stand is warmer than the laptop. Normally you just wouldn’t put the two next to each other. In real life, in the time it takes you to look from one to the other, your eyesight will compensate. This example is from our review of a professional viewing cabinet, where I’ve written more about this aspect of matching. There is a slight weakness in this system if you send your images to a third party for them to use. Your print might not be a ‘correct’ version of the test file, so if you are basing your edits on how your own prints look, there is a potential for introducing a systematic error. The expensive way to get round this is to use a certified proof print for your comparisons, however using a known good test image is more than good enough for most people. A good colour test image contains enough ‘common’ colours that should show up printing problems (skin colours for example). One quick way to see whether your print viewing light level is at the same as your monitor is to display a white screen, and take a photo of it. 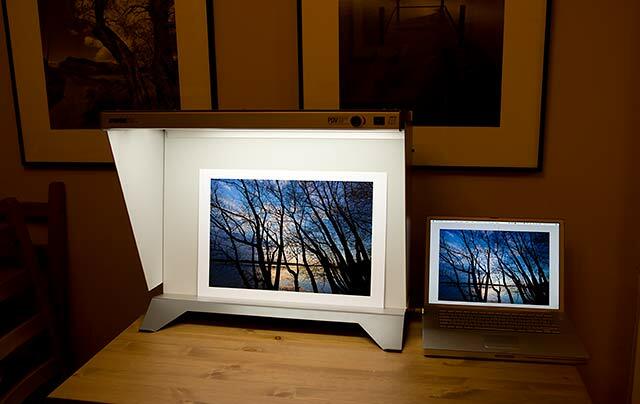 Then with the same camera settings, take a photo of a blank white sheet of paper under your viewing lighting. Look at both images on your monitor and you’ll see which is brighter. In fact, you don’t even have to take the photos if your camera has a spot meter or you get close enough to fill the field. I’m not talking of exact matches here – half a stop shouldn’t make much difference. I’ve assumed that to adjust your editing, you have a good print to look at. What if your printer isn’t producing very good prints? This is where printer profiling may help. It’s a way of matching up the colours and brightnesses in your image to the particular capabilities/quirks of your ink/paper/printer combination. It’s not a panacea, there are some combinations that don’t work, and there are some printers that just aren’t very good for particular types of print. We’ve many reviews of printer profiling solutions on this site, several of which also contain more general information about the process. The thing to remember, is that the effectiveness of profiling in helping you produce better prints depends on you being able to correctly evaluate profile and print quality. Having consistent print evaluation lighting is important. It’s no good taking one print to the window to check in daylight, whilst the next one is looked at with a desk lamp. Let’s say you have set up some Solux lamps or even a simple Grafilite (right) to evaluate prints. This should produce more consistent results. What though if your consistent results are to be shown in dim lighting (a restaurant for example)? Your prints will probably look too dark in dim light. My own general solution is add a lightening curves adjustment layer to the final sharpened print file, before printing. For a large bespoke print I may create several small test prints with different settings, I’ll take these along to where the print is going and see which looks best. It is possible to create different ICC profiles for different viewing conditions (the SpyderPrint software allows this, as does the more expensive i1Profiler software, I often use at Northlight) This takes more work, so is generally only something I’d use for my larger commissioned prints. Don’t set your monitor too bright – this is the classic reason I find for people getting prints that look too dark. It’s no good turning down your monitor while still editing images in a bright daylight lit room – the environment sometimes needs ‘turning down’ too. ‘Too Dark’ is somewhat subjective – evaluate proper test images and look to set up some consistent approach to print lighting for evaluation. A bit more care in setting up your surroundings will help improve the consistency and accuracy of your work. Aim for consistent printing and then apply corrections for special print lighting as and when needed for specific prints. Dark prints revisited – If you’re having problems adjusting your monitor, I’ve some details of an experimental approach, using adjustment curve layers that may be of some help. Beware the colour management tar pit – As colour management hardware comes down in price, more and more people are being told it will cure all their problems. A personal view from Keith covering some of the things it is good for, but also why you should be careful to understand why you are doing it in the first place. The Viewing page – basic monitor set-up. Print viewing distances – what printer and image resolutions to use for different print sizes. An Introduction to colour management article by Keith and collection of CM info. Why do your prints look wrong?